The Stewart Manor Fire Department was organized back in 1927. On Sept. 28 of that year, the department held its first meeting. Edward Jackson was the department’s first chief. The first apparatus purchased was a 1926 Brockway pumper.Their next apparatus was a 1925 Mack “Bulldog” 500 G.P.M. pumper. They soon formed Company #1 and #2. Before they formed the Stewart Manor Fire Department they were known as Stewart Manor Co. #4, under the protection of the New Hyde Park Fire District. In 1954, they would purchase their first ambulance and would become Company #4. In 1936, they would replace the first pumper, which will become a tradition of many Mack pumpers they would eventually replace. Sadly in 1956, the first fire chief (Ed Jackson) would become the first member to die in the line of duty. There is now a commemorative statue of him recognizing the years he volunteered. In 1931, they would form another company. It would be the first rescue company under Company #3. They would go on to purchase a Diamond “T” Rescue Truck. In 1927, their Brockway pumper was stationed at Salisbury Avenue. By 1930, they would move to their new station on Covert Avenue, where they are still stationed. Today the Fire Department is part of the 1st Battalion with the Bellerose, Bellerose Terrace, Floral Park, Floral Park Center, Garden City, Garden City Park, New Hyde Park, Mineola and South Floral Park Fire Departments. 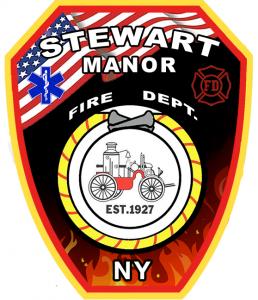 The Stewart Manor Fire Department is composed of 100% Volunteer Firefighters and Emergency Medical Technicians. Serving the Village of Stewart Manor and its surrounding communities, our volunteer first responders answer alarms for fire suppression, rescue, and emergency medical services 24/7 year round. The Fire Department Headquarters located at 120 Covert Ave houses two fire engines, a rescue truck, an Advanced Life Support Ambulance as well as two Chiefs Vehicles. Members train weekly in-house as well as at the Nassau County Fire Service Academy and Nassau County EMS Academy to ensure that we are ready to provide the best emergency services to our friends and neighbors in the Village and beyond.